No one here has surce of latest version. At least i have full source from beta 3, but i don't give it out until BAMsE come back or we have debate thinks like give the source to someone if BAMsE don't come back. Please additional_commands.iss if you upload. I have someone working on the Source(Beta 5 i am the only one with the last Source).But at the same time i want to maintain the level of work done by Yener and Bamse.I dont want to butcher their work it needs to maintain the high level of work they had put into it. The only other thing that might take some time is we need to protect the source again so a new compiler needs to be build from scratch as i dont have that source that. Well, i can only tell you that compiler.exe contains InstallerScript.iss + Inno Setup Enhanced Edition files. Both will be loaded into RAM, not on HDD to prevent source grabing. I don't know if there are any tools out there for that needs. My guess is that compiler.exe itself is a IS script compiled into an exe file, since it extract protection files for inno setup by altef_4 + setup.tmp (compiler.tmp). 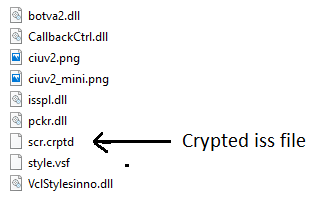 Edit: Have looked something, yes, compiler.exe is definetly a compiled inno script + protection (pckr.dll, isspl.dll, botva2.dll) to prevent extracting any data onto HDD. You can do many things with IS, not only conversion related things. For an example, look ISXPM.